I've read a couple threads about how to remove the OLDSMOBILE letters from the trunk lid but the links to new barrel nuts are all dead (and about ten years old). I've been searching but I'm not even sure they're called "barrel nuts". Anyone have a link handy? They are the tubular design; not what I would call speed-nuts. I've also been reading about the best ways to remove hood and rear window trim but my rear window trim is sealed to the vinyl top. Would I be opening a can of stinky worms if I try to remove that trim? There's a tiny bit of rust starting under than trim (yeah, I know, there's probably more but I'm not taking off the vinyl until next winter). They should just unscrew with a 1/4 drive socket (3/8ths I think). They are reusable, just replace the putty inside them. Eric, these are 1/8th inch diameter at best with no hex to them that I can see. I'll try to get a pic later. Au-Ve-Co calls them "tubular nuts". They are really snap-in friction fasteners. Here's the page from the Au-Ve-Co catalog. Thanks for the link Joe. I'd actually seen that before but couldn't find it this time. I guess I'll need to just pull one of the letters and do some measuring. Here's a pic. It's those little green jobs. sort of look like drywall anchors. Again, I'll have to measure. Let us know which ones fit... I will need some as well! Did not know later models used pushin fasteners, sorry for steering you wrong. It's those little green jobs. sort of look like drywall anchors. The green is just an anti-rust coating. The clips are metal. No worries, Eric. Input is always welcome. Good to know, Joe. They do look kind of plastic in the pic. I'll post an update when I verify which ones fit. I have seen tubular nuts & the regular speed nuts used on these trunk letters. Doesn't seem to be any rhyme or reason that I can tell. Acually, neither of the above links seem to be correct. 3/32" is too small and 3/16" is way too big. As I estimated, my posts measure 1/8th. But they're not a solid post; it's split with some sort of green glue inside. See pic. Looks like the best bet here are the Auveco's. Anyone know the thickness of the sheet-metal of the deck lid? My choices are .038-.044, .030-.036, .025-.035"
The .030-.036" picture looks to be the most similarly shaped tubular nuts with a retainer than compresses when tapped in rather than snapping back. Okay, I'm going with the Auveco 2611. My holes measure a tiny bit more than 5/32" but near 3/16" and since they don't have any nuts that measure 64ths, these must be it. I'll post back when I know for sure. The Dixied website wanted $10.72 for a box of 100. Fine. But they wanted $24 shipping? Not, I think, today. btrBill; if these fit, PM me your mailing address and I'll toss what you need in a small envelope. Last edited by Macadoo; February 26th, 2017 at 11:33 AM. The tubular nuts (in the link above) seem to work just fine. A small hammer and piece of pine works to tap them back in. I will let you know when they come in! Last edited by Macadoo; March 3rd, 2017 at 05:36 AM. Justin! How you doing, brother? Let me know if you need a few to test. I still have extras. Doing well Mac! Getting ready to figure out my drive train this spring I missed driving the old girl last summer. How did your rearenf gear swap go ? Gear swap went well. I did everything but the actual shimming. I chickened out and took it to a pro, lol. It seems a little sluggish under 2500 RPM but that's when the torque converter kicks in. 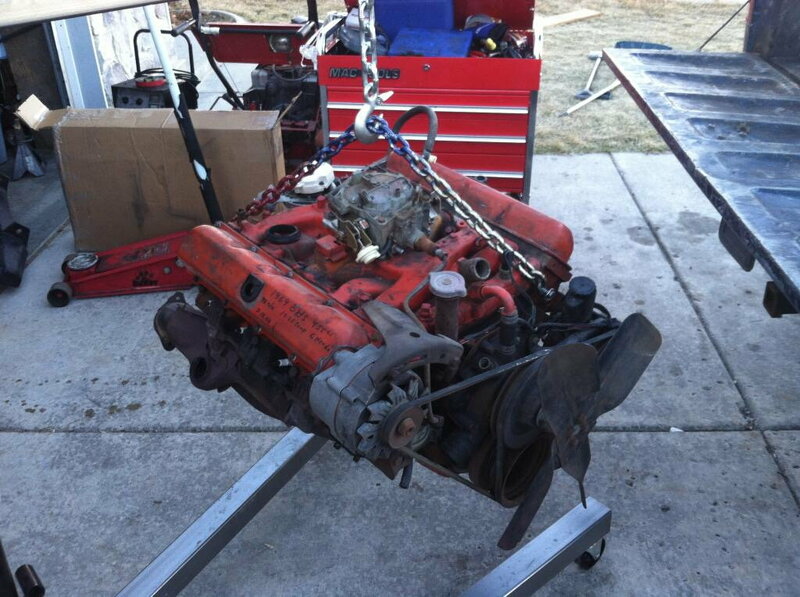 Did you finally pick an engine from all those 455s you have hangin' around? I am still planning on building my core block up but thinking of a drag car in my near future. Last edited by oldstata; March 6th, 2017 at 06:45 PM. A 69? Dang dude, that's red gold! Get some video uploaded when you get that thing in, will ya'? 2 Barrel too 4 Barrel Carb Linkage?? Quick Reply: O L D S M O B I L E letters barrel nuts?